Vemurafenib is used to treat a type of skin cancer (melanoma) that has spread or cannot be removed by surgery and has a certain type of abnormal "BRAF" gene. Vemurafenib works by slowing the growth of skin cancer cells. It belongs to a class of drugs known as kinase inhibitors. Read the Medication Guide provided by your pharmacist before you start taking vemurafenib and each time you get a refill. If you have any questions, ask your doctor or pharmacist. Take this medication by mouth with or without food as directed by your doctor, usually twice daily about 12 hours apart. Swallow whole with a glass of water. Do not crush or chew this medication. If you vomit after taking your dose, do not take an extra dose of this medication. Take the next dose of the medication at the regularly scheduled time. The dosage is based on your medical condition, response to treatment, and other medications you may be taking. Be sure to tell your doctor and pharmacist about all the products you use (including prescription drugs, nonprescription drugs, and herbal products). Do not increase your dose or use this drug more often or for longer than prescribed. Your condition will not improve any faster, and your risk of side effects will increase. What conditions does Zelboraf treat? Hair loss, dry skin, headache, nausea, vomiting, diarrhea, swelling of ankles/feet/hands, or joint/muscle pain may occur. If any of these effects persist or worsen, tell your doctor or pharmacist promptly. Vemurafenib may cause other types of skin cancer (such as cutaneous squamous cell carcinoma and melanoma) that usually does not spread to other parts of the body. (See also Notes section.) Tell your doctor right away if you have any skin changes including: new wart, skin sore, change in size/color of a mole, skin bump that bleeds or does not heal. Infrequently, vemurafenib may also cause or worsen other types of cancer (such as non-cutaneous squamous cell carcinomas of the head and neck; cancers with RAS mutations, such as certain types of leukemias). Consult your doctor for more details. Get medical help right away if you have any very serious side effects, including: eye pain/swelling/redness, vision changes (such as blurred vision, blind spot/shadows in the center of your vision, sensitivity to light), fast/irregular heartbeat, severe dizziness, fainting, liver problems (symptoms such as loss of appetite, extreme tiredness, stomach/abdominal pain, dark urine, yellowing eyes/skin), pain/trouble swallowing, heartburn, signs of kidney problems (such as change in the amount of urine, pink/bloody urine). Vemurafenib can commonly cause a rash that is usually not serious. However, you may not be able to tell it apart from a rash that could be a sign of a severe reaction. Therefore, tell your doctor right away if you develop any rash. List Zelboraf side effects by likelihood and severity. Before taking vemurafenib, tell your doctor or pharmacist if you are allergic to it; or if you have any other allergies. This product may contain inactive ingredients, which can cause allergic reactions or other problems. Talk to your pharmacist for more details. Before using this medication, tell your doctor or pharmacist your medical history, especially of: radiation therapy. Vemurafenib may cause a condition that affects the heart rhythm (QT prolongation). QT prolongation can rarely cause serious (rarely fatal) fast/irregular heartbeat and other symptoms (such as severe dizziness, fainting) that need medical attention right away. The risk of QT prolongation may be increased if you have certain medical conditions or are taking other drugs that may cause QT prolongation. Before using vemurafenib, tell your doctor or pharmacist of all the drugs you take and if you have any of the following conditions: certain heart problems (heart failure, slow heartbeat, QT prolongation in the EKG), family history of certain heart problems (QT prolongation in the EKG, sudden cardiac death). Low levels of potassium or magnesium in the blood may also increase your risk of QT prolongation. This risk may increase if you use certain drugs (such as diuretics/"water pills") or if you have conditions such as severe sweating, diarrhea, or vomiting. Talk to your doctor about using vemurafenib safely. Older adults may be more sensitive to the side effects of this drug, especially skin changes, nausea, decreased appetite, swelling of ankles/feet/hands, and QT prolongation (see above). Tell your doctor if you are pregnant or plan to become pregnant. You should not become pregnant while using vemurafenib. Vemurafenib may harm an unborn baby. Ask about reliable forms of birth control while using this medication and for 2 weeks after stopping treatment. If you become pregnant, talk to your doctor right away about the risks and benefits of this medication. It is unknown if this medication passes into breast milk. Because of possible risk to the infant, breast-feeding while using this medication and for 2 weeks after stopping treatment is not recommended. Consult your doctor before breast-feeding. What should I know regarding pregnancy, nursing and administering Zelboraf to children or the elderly? A product that may interact with this drug is: ipilimumab. Many drugs besides vemurafenib may affect the heart rhythm (QT prolongation), including amiodarone, dofetilide, quinidine, procainamide, sotalol, and certain antipsychotic medications (such as pimozide, thioridazine, ziprasidone), among others. Other medications can affect the removal of vemurafenib from your body, which may affect how vemurafenib works. Examples include azole antifungals (such as ketoconazole, itraconazole), macrolide antibiotics (such as clarithromycin), HIV protease inhibitors (such as ritonavir, atazanavir), telithromycin, nefazodone, St. John's wort, among others. Vemurafenib can slow down the removal of other medications from your body, which may affect how they work. Examples of affected drugs include caffeine, warfarin, among others. Does Zelboraf interact with other medications? Should I avoid certain foods while taking Zelboraf? Lab and/or medical tests (such as BRAF testing, liver function tests, kidney function tests, EKG, blood mineral levels) should be done before you start taking this medication and while you are taking it. Keep all appointments as it is important to have regular skin exams (such as every 2 months) while taking and for up to 6 months after stopping treatment with vemurafenib. Consult your doctor for more details. If you miss a dose, take it as soon as you remember. If it is within 4 hours of your next dose, skip themissed dose and resume your usual dosing schedule. Do not double the dose to catch up. Store at room temperature. Keep this medication in the original container away from light and moisture. Do not store in the bathroom. Keep all medication away from children and pets. 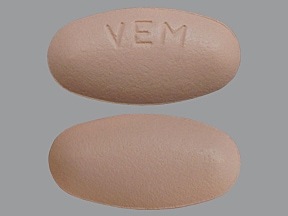 This medicine is a pinkish-white, oblong, film-coated, tablet imprinted with "VEM". Are you considering switching to Zelboraf? How long have you been taking Zelboraf?